Impressive: Leong with an artist’s impression of Icon City. PETALING JAYA: Mah Sing Group Bhd will focus on lower-priced and smaller units of serviced apartments in the next two years to cater to demand of the young population. Managing director/chief executive Tan Sri Leong Hoy Kum said the property developer would also offer lower-priced strata landed units. “We are targeting to achieve sales of RM2.5bil next year and, in order to do this, we will adjust our product mix, in line with today's sentiment and needs,” he told StarBiz. He said the group had a sales target of RM2bil for this year. As of September, it had already achieved RM1.74bil in locked-in sales, he said, adding that the company had a total of 30 on-going projects. Last year, the company enjoyed RM1.5bil in sales. “We are still positive on the sector for the next year and we hope, despite a prolong European debt crisis, there will be a soft landing. We believe the demand for properties will continue to be buoyant because we have a young population and there is a lot of rural-urban migration,” he said. Leong said property purchase was very much driven by two factors job security and sentiment. The country's savings rate and healthy employment market are the other factors contributing to the strong property sector. “Beginner homes below RM500,000 will meet buyers' needs,” he said. The company will be offering residential properties ranging from landed with gated and guarded communities, smaller serviced apartments and small and versatile offices on commercial titles for the coming Star Property Fair from Nov 25 and 27. It will be promoting its projects in Icon City in Petaling Jaya, Icon Residence in Mont'Kiara, M City Jalan Ampang, Garden Residence in Cyberjaya and Kinrara Residence in Puchong. Although the company is promoting its Klang Valley projects, the group is also active in Johor, where it has five projects and another five in Penang. “We see continued demand for landed residential properties in good location, especially in gated and guarded schemes. Investors know that land is scarce and construction cost will always continue to rise, although in manageable doses. It is inevitable that properties in good locations will continue to appreciate as well, and astute buyers will want to lock in their investments at today's prices,” he said. In today's market, he said, prices of high-end homes were expected to soften a bit. “We expect mid- to high-end uniti to be popular. Semi-detached units priced at about RM1.4mil or thereabouts will be in demand. For bungalows it will be those RM3mil or thereabouts. The location, accessibility and the availability of amenities are other contributing factors to the success of a project,” he said. At the same time, the company is also replenishing its land bank. It recently purchased a piece of land in Rawang of about 90ha for RM92mil. KUALA LUMPUR: Nadayu Properties Bhd, formerly known as Mutiara Goodyear Development Bhd, will use part of the cash from disposing of its non-core assets to buy land in the Klang Valley. Yesterday, shareholders approved Nadayu's plan to dispose of four office lots and 3,087 car-park bays in Selangor to a company, called Park Access Sdn Bhd, for RM42.6 million. 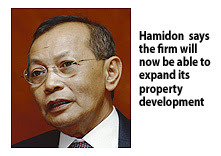 Nadayu executive chairman Hamidon Abdullah is happy with the stakeholder approval as it will free up cash for the company, which should help it focus on property development. "We will be able to buy more land now and expand our property development activities. We have pockets of land in Sunway, Melawati and Cyberjaya. If we want to spread our resources, we will look at land nearby these areas," Hamidon said after the company's extraordinary general meeting (EGM). Hamidon aims to grow the company to become a niche developer, focusing on medium to high-end developments in the Klang Valley and Penang. "As we move forward from one development to another, we will look for more innovation and incorporate green elements. We want to ensure our projects have elements of sustainability, hygiene and security," Hamidon said. Nadayu has three projects worth RM1.5 billion for launches in Bandar Sunway, Cyberjaya and Bukit Gambir in Penang, starting from the current quarter. On rising raw materials prices, Hamidon said the company will look into the matter to ensure its profit margin does not erode. "Sometimes we have to bite the bullet to give the same template and that is when our profit margin will erode. So we have to build in volume and be mindful of what we provide," he said. Meanwhile, Hamidon said he has no plans to sell Nadayu or merge with other developers despite being approached by several parties. "We are not keen at this point. We are still in the process of adding value to the company and building the brand name," he said. The company changed to its current on June 20. PETALING JAYA: Bandar Raya Developments Bhd (BRDB) has yet to appoint an independent international property valuation firm to manage the tender exercise for the sale of BR Property Holdings Sdn Bhd, which owns the successful Bangsar Shopping Centre and Menara BRDB as well as the CapSquare Retail Centre and the Permas Jusco Mall. “We will make an appropriate announcement when the details are confirmed,” said BRDB in a statement via email to StarBiz. The tender exercise to dispose of the prized assets came about in late September after BRDB's board of directors decided to call off a plan to sell BR Property Holdings to Ambang Sehati Sdn Bhd. Ambang Sehati, BRDB's major shareholder with 18.88% stake, had earlier proposed to buy the four assets for RM914mil. Ambang Sehati is the investment vehicle of BRDB chairman Datuk Moiz Jabir Mohamed Ali Moiz. Ambang Sehati would also be invited to participate in the tender exercise. Meanwhile, an outstanding issue in the earlier proposed sale to Ambang Sehati was the identities of those who own the much-talked-about 23.6% block of shares in BRDB held in a nominee account by Credit Suisse. This block is said to hold some sway in deciding whether the deal would have gone through. Bursa Malaysia had highlighted via a letter to StarBiz earlier this month that statements published in the media, which were attributed to the exchange's chief executive officer Datuk Tajuddin Atan, concerning enquiries into the owners of the 23.6% block of shares in BRDB were inaccurate. BRDB said it had answered all queries raised by Bursa Malaysia. KUALA LUMPUR: Boustead Holdings Bhd will be negotiating with the Penang state government on compensation amounting to RM20.8 million. The claim was made after the Penang state government cancelled a plan to allow Boustead to reclaim up to 0.16 ha of land off the Penang Bridge. In a filing to Bursa Malaysia today, Boustead said the amount of the compensation is as verified by independent consultants. "Boustead is still in negotiations with the Penang Chief Minister and the state government on the form of compensation to be paid. "An announcement will be made by Boustead in due course setting out the terms of the compensation once the same have been agreed by Boustead and the Penang state government," the company said. Boustead was initially given the rights as part of a compensation package for agreeing to scale down a hotel development project in the state's heritage zone. On Monday, a statement from Chief Minister Lim Guan Eng's office said the decision was made following public consultation and a legal notice sent by Boustead to a state assemblyman who was defending his constituents in the affected area. George Town: The Penang state government has cancelled a plan to allow Boustead Holdings Bhd (BHB) to reclaim up to 0.16 hectares of land off the Penang Bridge. Boustead was initially given the rights as part of compensation package for agreeing to scale down a hotel development project in the state's heritage zone. A statement from Chief Minister Lim Guan Eng's office, obtained by Business Times yesterday, noted the decision was made following public consultation and a legal notice sent by Boustead to a state assemblyman who was defending his constituents in the affected area. "After much public consultation, the Penang State Government has taken cognisance of the views of the residents of Putra Marine, Gold Coast and Bay Garden and decided not to pursue the land reclamation at Bayan Bay to Boustead. "To pursue the land reclamation deal with Boustead under the shadow of the legal notice of defamation sent by Boustead to (Pantai Jerejak) assemblyman Sim Tze Sin is wholly inappro-priate," Lim said in the statement. "Boustead will still be required to comply with the World Heritage building height control of 18 metres within the heritage core zone of George Town. "The form of compensation to be paid and whether it should be paid," Lim added, "is still subject to further negotiations with Boustead". Boustead was in the midst of constructing a one-block 300-room Royale Bintang Hotel in George Town's heritage zone in 2009, when works were halted following reports the development could place George Town's heritage status in jeopardy. Boustead is one of four developers who have been singled out for undertaking projects exceeding the height restriction in the heritage city's buffer and core zone. The others are Asian Global Business (AGB) Sdn Bhd, Eastern & Oriental Sdn Bhd and the Low Yat Group. All the firms had approval from the Penang Island Municipal Council for projects exceeding the 18m limit, well before George Town was placed on the World Heritage List in July 2008. Last year, Boustead said it was seeking compensation from the Penang state government for agreeing to reduce the height of its proposed hotel. It is learnt that the company had sought RM20.8 million as compensation. A Boustead spokesman, meanwhile, said the company was waiting for the state government to make a decision on the compensation. "They have to pay us either in the form of land reclamation or cash reimbursement. They have to make a decision as to how to pay us, so we can recover the money we have spent," the Boustead official said. The spokesman did not divulge the amount spent by Boustead on its hotel project, except to say that they had completed between 10 and 15 per cent of work so far. KUALA LUMPUR: Tiara Best Sdn Bhd, a 70% subsidiary of Engtex Properties Sdn Bhd, has acquired two piece of leasehold land, through public auction, for RM31mil. The agriculture land, totalling 72.8 ha, is located in Puncak Alam, a main township in Kuala Selangor. In a filing with Bursa Malaysia yesterday, Engtex Group Bhd said Tiara Best intended to convert the properties into industrial land and then develop it into an integrated industrial park with an estimated gross development value of RM166mil. Engtex Properties is a wholly-owned subsidiary of Engtex Group. Based on preliminary plans and subject to the approval of relevant authorities, Tiara Best will offer industrial lots for sale within the industrial park. KUALA LUMPUR: Selangor Dredging Bhd (SDB) says Champsworth Development Pte Ltd (Champsworth), has served on the sale committee, a Call Option Notice to sell a property in Singapore. The property is known as The Village, situated at Pasir Panjang Road, Singapore. consideration for the property is RM223.75 million and was agreed upon on a willing buyer and willing seller basis. Champsworth is a 50 per cent associate company of SDB International Sdn Bhd, which in turn is a wholly-owned subsidiary of SDB. SDB said if the acquisition of the property is duly completed, the purchase consideration and development will be funded by a combination of internally generated funds and/or bank borrowings of Champsworth. GEORGE TOWN: Construction of the second Penang bridge is likely to be completed two months ahead of its projected November 2013 schedule. Subject to weather conditions and other considerations, it was likely that work on the new bridge will achieve 70 per cent progress by the end of this year, Works Minister Datuk Seri Shaziman Abu Mansor said yesterday. The bridge connecting Batu Kawan on Penang mainland and Batu Maung on the island will be the longest in Southeast Asia at 16.9km. Total estimated construction cost is RM4.5 billion. "The dedication by the project contractors in seeing to the smooth running of the project may see it completed two months ahead of its scheduled completion," Shaziman told reporters after visiting the project site. Work on the bridge, which will serve as the third link between the island and the mainland (after the ferry service and first Penang bridge) and set to provide better connectivity and accessibility to and from the island, began in November 2008. It comprises a two-lane dual carriageway with shoulders and a dedicated motorcycle lane. Its design is depicted as a 375m cable-stayed bridge with a main span of 240m over the southern channel with a 30m height clearance. The bridge is a joint-venture project between China Harbour Engineering Company Ltd and UEM Builders Bhd, with Jambatan Kedua Sdn Bhd (JKSB) appointed as the concession holder. JKSB, which is wholly owned by the Minister of Finance Incorporated, is responsible for the construction, management, operation and maintenance of the bridge and has been given a 45-year concession for the project.